St Thomas More David Hollenbeck goes a play with his team. STM rebounded with a win Friday over Madison. SIOUX FALLS, S.D. 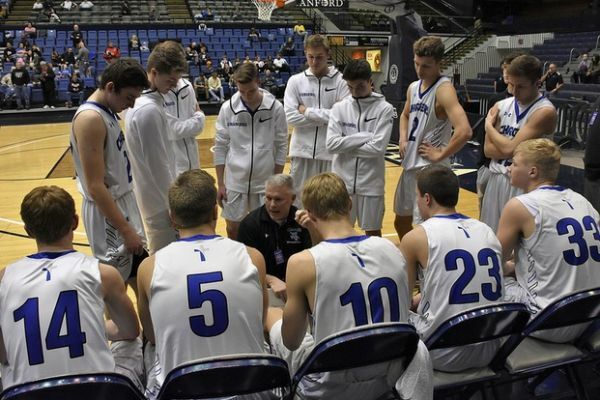 - Tea Area came out triumphant in a tough battle with Pine Ridge to earn a trip to the South Dakota Class A Boys Basketball Championship game Saturday night. Pine Ridge came into Friday's semifinals riding high off a win over Hot Springs Thursday. The two teams played equally good basketball the first two quarters as Tea enjoyed a two point 30-28 lead at halftime. A 17-11 run in the third quarter, however, would be all Tea needed to escape with a 57-51 win. The Thorpes had three players score in double figures - led by Charles Schrader's 14 points. Halen Bad Bear added 12 and Corey Brown chipped in 11. Pine Ridge will play Lennox for third place after the Orioles lost Sioux Falls Christian 53-46. Christian will play Tea for the championship. St Thomas More will play in the consolation final for fifth place Saturday after a 58-43 victory over Madison. They will play Dell Rapids, who beat Hot Springs 47-37 in the other consolation semifinal. Meanwhile, the St Thomas More girls basketball team also fought back after an opening round loss and defeated Mt Vernon/Plankinton 58-38 in consolation play. Haleigh Timmer lighted up the scoreboard for the Lady Cavaliers, leading all scorers with 28 points and added 12 rebounds in a dominating day. They will play Todd County for fifth place Saturday after the Falcons beat Aberdeen Roncalli in the other consolation semifinal 62-52. West Central will play Winner in the State A Girls Championship game. West Central just got by Lennox 44-41 and Winner rolled over McCook Central/Montrose 66-44.